Our second day in Paris began on Île de la Cité – an island in the Seine River which has some major medieval monuments and is considered as the centre of Paris. Our first visit was to the most famous cathedral of France – Notre-Dame de Paris. But before going to the main cathedral, we visited the Archaeological Crypt of Notre-Dame which is located under the square in front of the cathedral. The crypt contains the archaeological ruins that were discovered during excavations in 1960s and 1970s. These ruins, along with some large maps, models, pictures, information boards and interactive videos and media give a good account of the transformation that the city of Paris (especially Île de la Cité) has undergone since the tribe of Parisii first settled there more than 2000 years ago. They also give an idea about the social life of people in middle ages. After spending about 45 minutes inside, we emerged from the crypt and joined the line of people waiting to enter the Notre-Dame cathedral. The first thing that stuck us after entering the cathedral was the stunning stained glass windows of the cathedral. We spent some time walking around the cathedral admiring those windows and various other sculptures. Next, we joined another line of people who were waiting for access to the Notre-Dame roof. Several narrow staircases led us to the roof of the cathedral and this is where the actual gothic magnificence of Notre-Dame becomes apparent. As we walked through the narrow pathways on the roof we saw the gargoyles, chimeras, the cathedral’s spire and other biblical sculptures from up close. The view of the entire city of Paris sprawled all around us just added to the exquisiteness of the whole setting. We also went in the South Tower of the cathedral and climbed some creaky wooden steps to see the largest, oldest and the most famous bell of the cathedral – Emmanuel – which weighs 13,000 kg with its clapper alone weighing 500 kg. We eventually exited the cathedral and now with no other line to join, we spent some time clicking photos and admiring the beautiful sculptures that adorned the cathedral’s exterior. Our next destination in Île de la Cité was Sainte-Chapelle – a hidden gem that surprisingly attracts very few visitors. This 13th century gothic chapel was originally constructed within Palais de la Cité to serve as the royal chapel and to house precious Christian relics, including the Christ’s Crown of Thorns and a fragment of the True Cross. Now it is one of the last remaining vestiges of the medieval palace. The chapel had a rather plain and unimpressive exterior especially when compared to the nearby Notre-Dame. The lower level was decorated in rich vibrant colours and had a regal look about it. It had a statue of Virgin Mary and some beautiful stained glass windows. But it was the upper level which produced the sort of mind numbing, jaw dropping effect on us that we hadn’t experienced after leaving Italy. On 3 sides we were surrounded by 15 m high, larger than life stained glass windows made with such finesse and detailing that it left us completely spellbound. And it wasn’t just random art. These windows depict the entire biblical history. Each window reads from left to right and from top to bottom. Some people even sit in the chapel from morning to evening and read each window as the sun lights up different window panes throughout the day. The upper level also has some beautiful wall paintings and the sculptures of the 12 apostles but I wonder how they were even meant to be seen amidst that exquisite stained glass art? Unfortunately we were short on time so after spending some more minutes gaping in awe and astonishment at those windows we decided to leave. We walked across from Sainte-Chapelle to Conciergerie, the other remaining vestige of Palais de la Cité and a building of extreme historical importance. The Conciergerie, earlier a part of Palais de la Cité, was converted into a prison once the Kings of France abandoned the palace in the 14th century and moved to other palaces. It served as the primary prison during the French Revolution era and became the holding place for the prisoners before they were sent to the guillotine to be beheaded. The most famous prisoner of Conciergerie was Marie-Antoinette. 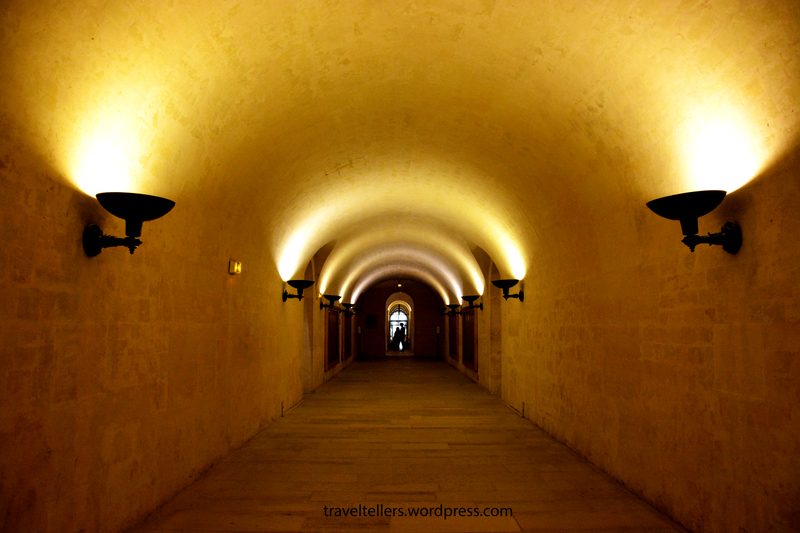 The entrance to the Conciergerie led us to an extremely large pillared hall known as The Hall of the Soldiers. There was another smaller hall adjacent to it known as Hall of Guards. Both these halls were bare and had a grim atmosphere. We then saw the offices of the head of Conciergerie, clerks and other officials. Next up was the room where the condemned were prepared for execution. We also saw the prison cells, the women’s wing and finally Marie Antoinette’s cell. The Conciergerie was different than any other place we had visited till now and our experience of it was quite sobering. After spending the better part of our morning and afternoon in Île de la Cité, we finally left the island and made our way to Panthéon. This 18th century monument was originally built as a church but is now a mausoleum. Though the Panthéon was quite imposing, the exterior looked to us a lot like Rome’s Pantheon except for the dome which resembled the dome of St. Peter’s Basilica. There was also some renovation work being carried out on the dome. The Panthéon was huge and spacious from inside and had some sculptures and frescoes but on the whole we found it quite unremarkable and underwhelming. 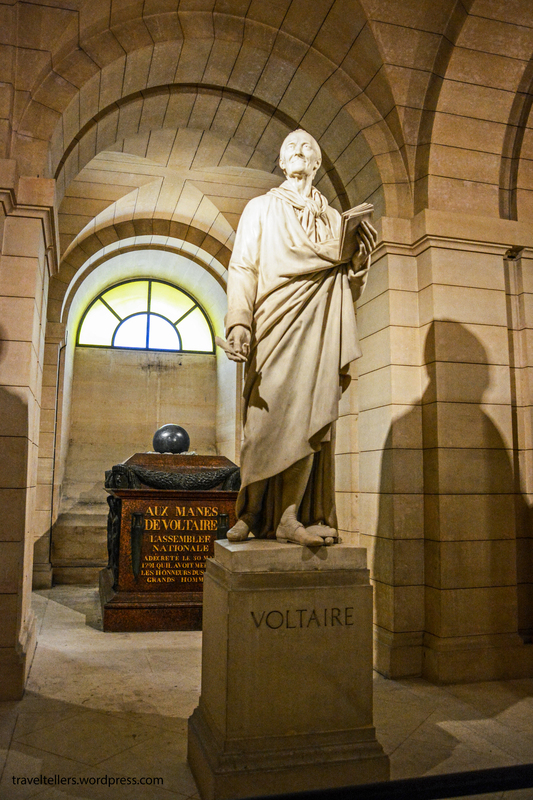 Probably the best part of the monument was its crypt where legendary French figures like Voltaire, Rousseau, Victor Hugo, Emile Zola, Louis Braille, Alexandre Dumas, Marie Curie, Pierre Curie etc. are buried. Our final destination of the day was the most famous museum of all – Musee du Louvre and if the Panthéon was underwhelming then the Louvre was nothing short of overwhelming. Originally a royal palace, Louvre is now among the largest museums in the world and displays almost 35,000 works of art at any given time. We took a metro to the Louvre metro station from where there was a direct underground connection to the museum. We reached the museum at approximately 6:30 pm and with Louvre open on Fridays till 9:45 pm, we had around 3 hours to see the 35,000 objects. No pressure then! At the entrance of the museum we saw the famous inverted pyramid and took photos. Further ahead we found out that the museum was divided into 3 wings – Sully, Richelieu and Denon. Completely clueless as to where to go, we randomly chose the Denon wing and entered a room containing Egyptian antiquities but we quickly realized the futility of trying to cover the Louvre in a random manner. Thus, we took a floor plan and made our way straight towards the lady which even its creator must not have imagined would become so legendary – the Mona Lisa. The painting was quite small and was surrounded by tourists who were intent on clicking selfies with Mona Lisa. We observed the painting for some time from a side, took a photo and walked away. Again faced with the dilemma of where to proceed next, we came up with an idea. We sat in a corner, searched for 15 masterpieces of Louvre on internet and found their location on the museum’s official site. We spent the next 150 minutes running around the museum searching for and then admiring those masterpieces which included some extremely famous paintings and sculptures. In the end thoroughly tired but genuinely impressed by what we saw, we exited the museum. We stopped to admire the Louvre and its pyramid entrance one last time under the darkening sky before bidding it goodbye. What we understood from our Louvre experience was that while visiting this museum you should not think about covering the entire museum (unless you have 1 week in hand). You should just focus on what interests you the most and try to cover just those parts. While returning to our apartment, we saw a breath-taking sight from the windows of the metro. We knew we were going to see it again the next day but this time from a much closer distance. Great stained glass photos! Have you been to Chartres? Yes those stained glass windows were truly marvelous. We haven’t been to Chartres yet but would certainly like to visit in future. The Notre Dame is stunning! Love the stained glass! Previous Previous post: Bonjour PARIS!